Physical fitness and team spirit are very important essentials for Indian Navy ethos. The Navy stresses the importance of fitness to its personnel. That is why we provide our personnel free access to high-quality sports facilities on board ships and shore establishments. Many of our ships have gymnasiums on board. Team sports are encouraged and number of sporting championships are organised within the Navy. The Navy which is predominantly known for its maritime prowess also has many national and international champions in its sports arsenal. A number of naval sportsmen have done the country proud by winning several medals at various national and international competitions. Arjuna Award 2012 :- The President of India conferred the prestigious ‘Arjuna Award 2012’ to Omkar Singh, MCPO II for excellence in Shooting. This award was conferred to a naval sportsman for the fourth consecutive year. Padma Shri 2013 :- The President of India has conferred ‘Padma Shri’ on NG Dingko Singh, MCPO STD I, Coach of Navy Boxing Team for the year 2013 for distinguished Service in the field of sports (Boxing). Services Best Sportsman Award 2013 :- Omkar Singh, MCPO II was awarded 'Services Best Sportsman’ for the year 2013 for excellence in Shooting. Services Best Sportsman Award 2014 :- Harpreet Singh, MCPO II was awarded 'Services Best Sportsman’ for the year 2014 for excellence in Shooting. Adventure activities are an important facet of Human Resource Development. 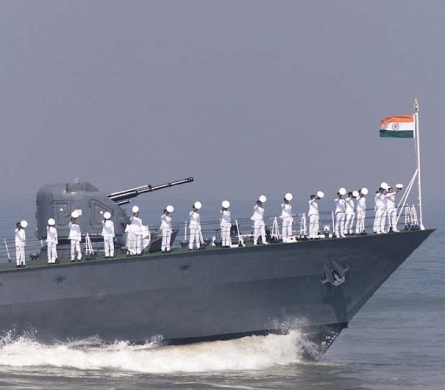 It is essential that naval personnel are engaged in activities which help them develop camaraderie, team spirit, initiative, agility, mental and physical toughness, strength of character etc. In the Navy, adventure enthusiasts and budding sportsmen are encouraged to excel through a well-planned and systematic training schedule. 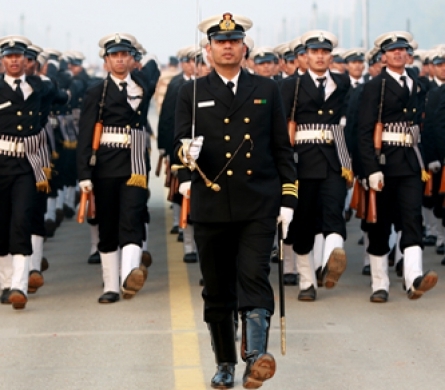 Many naval personnel have excelled in sports and adventures activities and have brought laurels to the country. An ascent of Mt Everest which stands at 8850 m is considered ultimate challenge in the mountaineering world. The Indian Navy embarked on an expedition to Mt Everest in 2004 taking the difficult North Face route via Tibet. 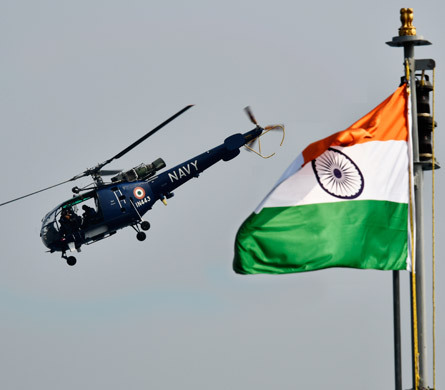 The expedition was flagged off in a unique manner from the depths of the ocean by the-then honourable Raksha Mantri, Mr George Fernandes, on 08 Mar 2004 aboard INS Sindhuraj from a depth of 50 m. The Indian Navy team consisted of 13 members and five summited the peak over two days, 18 and 19 May 2004. It was the first all-Navy team to summit Everest in the world and also the first Indian Armed Forces ascent from the North Face, which is a national record. First Indian Team to ski to South Pole. First Indian Everest Summiteers to reach the South Pole. First Armed Forces Team since 1912 to ski to South Pole. First organization in the world to reach all the 3 Poles. First Indian team to ski to geographic North Pole. First Indian team to ski to both poles. First Indians to do all poles. A thirteen member team of the Eastern Naval Command undertook a challenging expedition to the twin peaks of Mt Kamet (7756 M) and Mt Abi Gamin (7355 M) in the Garhwal Himalayas from 09 May 16 to 11 Jun 16. The team has achieved unprecedented success by summiting both the peaks on 02 Jun 16 and 04 Jun 16 respectively. Mt Kamet, the third highest peak in India, is the highest peak open for mountaineering. Thus, the Naval Ensign has been planted at the highest point possible within the geographical boundary of the country. A 12 member team led by Lt Cdr Vineet Doshi successfully summited Mt Satopanth (7077M) in Gangotri region on 17 Jun 16. The team had representation from all Naval Commands. Another unnamed peak (Pt 6020) in vicinity was also conquered by the team during the descent phase. The 1st NPC scheduled at Amreli, Gujarat under the aegis of Aero Club of India was conducted from 01-05 May 16. Two naval teams of 05 members each participated in the championships and secured Ist and IVth positions respectively. Capt RV Singh, Lt Cdr Anand Revi and Wajauddin PO CD I excelled in the individual category by securing the II, V and VII position overall and were selected for the World Parachuting championships. On 22 May 2010 Cdr Dilip Donde joined the elite club of Solo Circumnavigator after having Circumnavigated the globe on Mhadei. The Sagar Prakarima I was flagged off on 19 Aug 2009 from Mumbai in an attempt to Solo Circumnavigate the globe The Sagar Parikrama I culminated successfully after covering a distance of 23000 Nautical Miles crossing all the major oceans. Cdr Dilip Donde became the first Indian in recorded history to have successfully Solo Circumnavigated the globe with four stoppages viz Freemantle, Christchurch, Falkland and Cape Town in 273 days. For his historic achievement Cdr Dilip Donde was awarded the Shaurya Chakra, Tenzing Norgay and Macgregor Medal. On completion of Sagar Parikrama I, which successfully established the credentials of Indian Navy in ocean sailing adventure, it was felt to undertake the next logical step ie to embark on a Non-Stop Solo Global Circumnavigation. 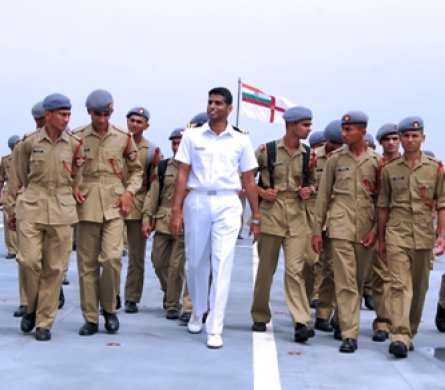 Lt Cdr Abhilash Tomy undertook this mission and Sagar Parikrama II was flagged off from Mumbai on 01 Nov 12. During the expedition, the officer has sailed non-stop covering all the three major Capes viz Cape Leeuwin, Cape Horn and Cape of Good Hope. The Sagar Parikrama II was completed on 31 Mar 13. During this expedition, Mhadei traversed approximately 22600 nm in 150 days. Through Project Sagar Parikrama the Indian Navy has stamped its authority on the Maritime World and displayed the professional acumen of our young mariners. For his historic achievement Lt Cdr Abhilash Tomy was awarded theKirti Chakra and Tenzing Norgay adventure award.